The past few weeks, I have been texting from my Android phone a lot more than usual, and I haven't even had to touch the device, thanks to a smart application that leverages the marriage between Google Chrome and my mobile OS to send messages directly from my browser to any phone number - making a text as simple as posting an instant message or a new entry in a chat window. 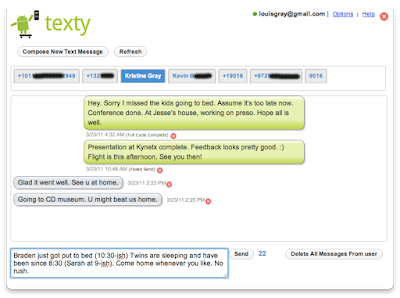 Texty, available in private beta, brings SMS text messages to and from your Chrome browser in real-time, immediately as they hit your Android device. Even more amazing is that texts you send from Chrome are synched to your phone, and the recipient doesn't have any clue - seeing your phone number as the originator. If you are one of the early testers of Texty, getting started is very easy. Find the Texty Android app on Android market and install it on your phone. Then link it with your Google profile. After this is done, install the Texty Chrome extension, and login with your Google profile. If there is a match between the app on your phone and the extension and you are on the whitelist, you are good to go. 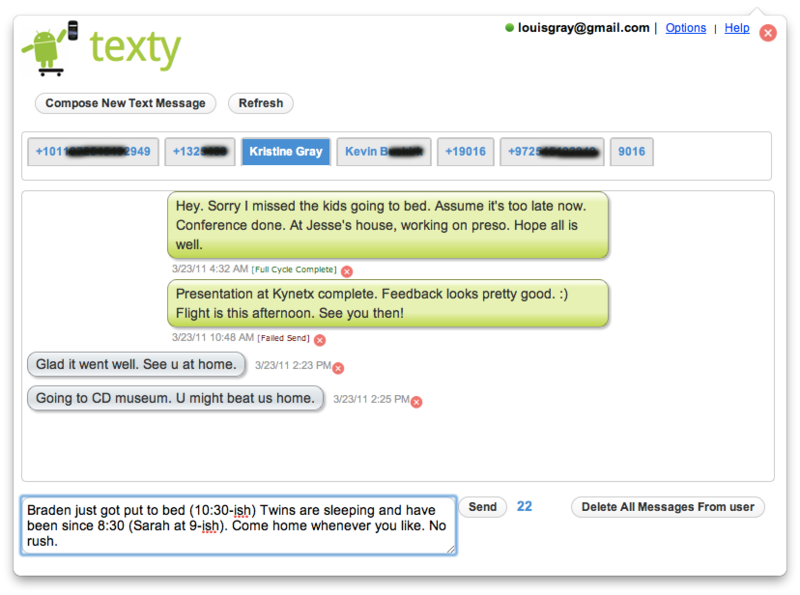 The Texty extension is displayed as an add-on to Chrome, and you can head there to send and receive messages, or even monitor notifications from carriers, such as the arrival of a new voice mail. Now, instead of having to stop what I am doing on the laptop to pick up the phone and text, leery of getting yet another text shortly afterward and getting interrupted again, I just manage all my SMS texts via Chrome and keep going. For power texters who are also power desktop jockeys, the arrival of this app is going to be very useful. Shouldn't be too long yet until the app comes out of beta. 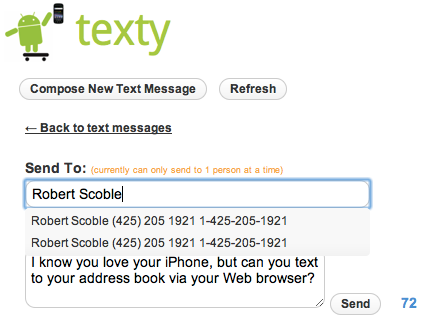 Until then, if you want to join early, head to http://textyapp.com/beta and tell them Louis Gray sent you.